alph – You must be nuts! This is Alph, Beel & Chah-Lee’s New Year message, which we’re sending to our friends and relatives. We’ve uploaded it as an unlisted video on YouTube to allow you to share the YouTube link (http://youtu.be/bs9tMzxLoWQ) with people you care about too. As with the film and the prequel, the puppeteers were Enrique Nicanor (Alph & Beel) and Kaberi Chatterjee (Chah-Lee). The voices were provided by Enrique Nicanor (Beel) and Obhi Chatterjee (Alph & a rather hoarse Chah-Lee!). 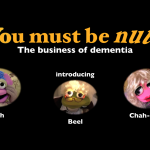 Poster image for You must be nuts! I should introduce you to my friends Alph, Beel and Chah-Lee. They are puppets. You must be nuts! tells the story of how their exploration of the film’s interviews changes their lives. Alph and Chah-Lee are husband and wife. They live in the UK. Chah-Lee is the more health-conscious of the two. Every time a new diet becomes popular, she has been following it in the hope of returning to her once-slim figure. Alph is the one I know best and through whom I met Chah-Lee and Beel. He is fascinated by current affairs and science. His iPad is his window on the world and we came to know each other through an online science discussion forum. Beel is Chah-Lee’s Spanish father. He has travelled extensively and has lived in Spain, the UK, Latin America, the US and France. He met and married Chah-Lee’s mother while he was living in the UK. Chah-Lee’s keen interest in health developed partly in reaction to seeing her mother gradually put on weight. As Chah-Lee was growing up, her mother started suffering health problems related to her obesity and diabetes. As a result, after Beel had worked for many years as a senior executive, he and his wife decided to live in Spain. They set up ‘Beel’s Beach Bar’ together on its Mediterranean coast. Although Chah-Lee’s mother passed away a couple of years ago, Beel continues to run the bar. Needless to say, Alph, Beel and Chah-Lee are fictitious characters. Any resemblance to real persons, living or dead, is purely coincidental. Of course, Alph, Beel and Chah-Lee could be anyone – A, B and C – and they could be living anywhere in the world. 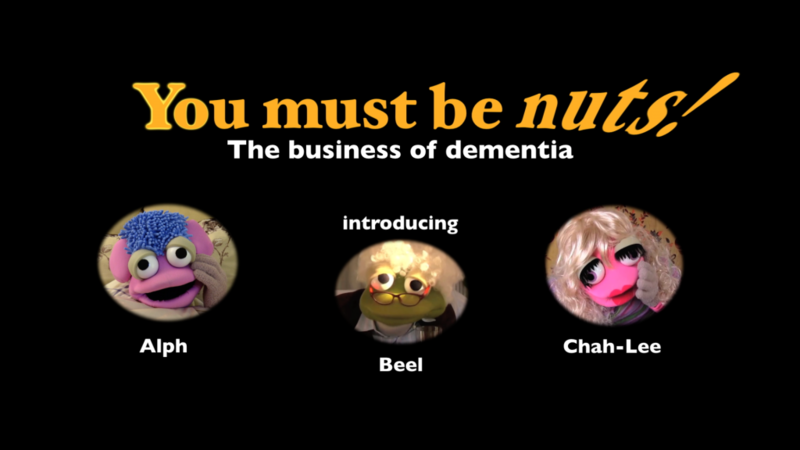 Their dialogue is derived from various informal conversations with friends and colleagues over the past year about dementia, dietary advice, prescription drugs and/or what constitutes a healthy diet. It aims to cover all the typical questions which arise in any such discussion. The puppets were kindly created for the film by Enrique Nicanor. His past credits include creating and animating the original puppets for the children’s TV series The Magic Roundabout and producing and directing the Spanish version of Sesame Street for its first three years. Elisabeth Christ provided the voice of Chah-Lee, Enrique provided the voice of Beel and I provided the voice of Alph. Kaberi was the puppeteer behind Chah-Lee while Enrique was the puppeteer for Alph and Beel. 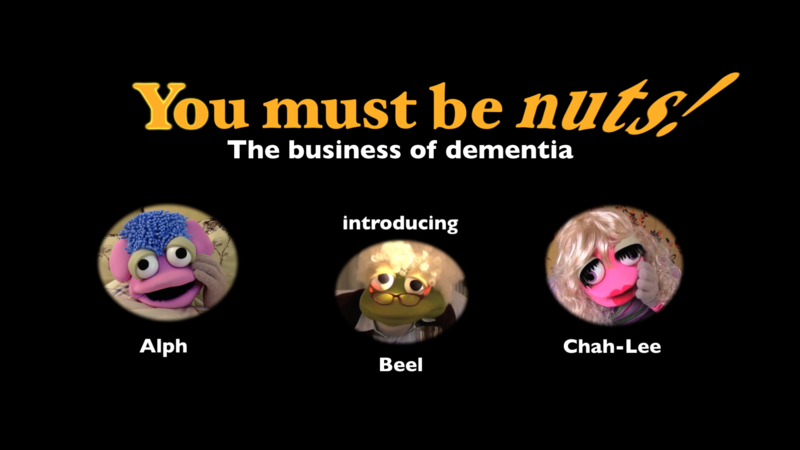 Amid the increasingly grim findings of my research and the challenges of caring for someone with dementia, Alph, Beel & Chah-Lee provided a welcome source of light relief. The two days of filming the puppet sequences were strenuous but fun. My father was our fascinated and patient live audience while we filmed the breakfast scenes over several hours on Saturday. Wishing you a dementia-free 2014 … and beyond.